Spanish designer Miquel Suay ventures beyond the walls of expectation. Drawing inspiration from architecture for his latest award winning collection, Cinetic, Suay is a designer who likes a challenge and sends a clear message to his audience with every runway show. From collaborating with wineries, to making brides-to-be feel empowered and seductive, his versatile style and intellect is leading him on a path to fashion glory. Check out Miquel Suay’s interview below! What was your inspiration behind your S/S 17 collection? This collection was dedicated as a tribute to the late Iraqi-born British architect Zaha Hadid, who passed away while I was searching for inspiration to create new pieces. These garments reflect the movement and fluidity that Hadid’s iconic buildings have. Her legacy is that of audacity and risk. She was a revolutionary, she broke every rule she knew and created timeless style, which redefined both creativity and architecture. Her point of view in terms of shape and structure was unique: a true statement that channels emotions. In a word, she embodied the avant-garde. I took her fascinating universe as a reference. Therefore, my garments evoke the same feelings of movement, fluidity and speed, and feature 3D effects and flawless finishings. This is the story behind Cinetic, my S/S17 collection. What was your favorite part about participating in Fashion Week Barcelona? This was my fourth consecutive season at 080 Barcelona Fashion, which is an extraordinary window to showcase my collections to the world. International journalists and buyers attended and it’s also a big event for Spanish fashion professionals. It contributes to the brand’s positioning, it allows you to work with notorious models…I can’t think of a single disadvantage! 080 Barcelona Fashion is a huge celebration of talent and creativity, and my collection, Cinetic, received the award for best collection of Spring Summer 2017. I was ecstatic, it’s really a true honor. 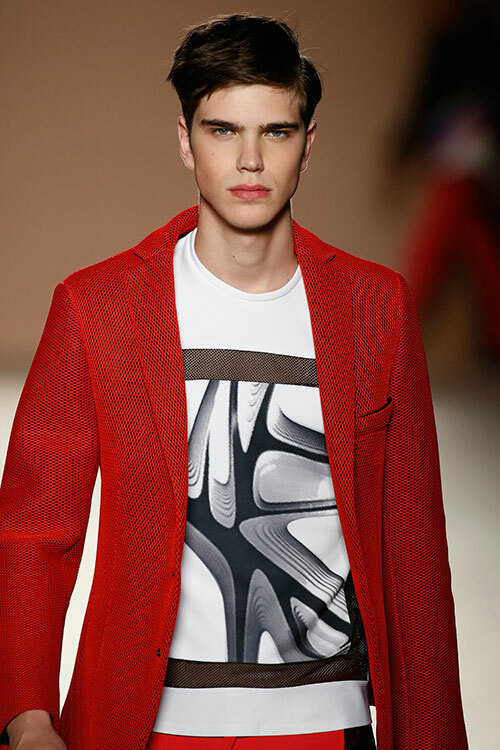 Model walks runway in red coat by Miquel Suay. I've seen some of your past work, all very gorgeous. You're brand designs gowns as well as prêt-à-porter, are you very fluid and versatile when it comes to being a designer? Mine is a family business. My parents founded it when I was a child. In the beginning, they focused on manufacturing first communion dresses. When I entered the company, we expanded our horizons and started developing different ceremony lines: wedding dresses, gowns, suits and tuxedos…we’ve gained a lot of experience throughout the years. Every single piece we develop is the result of our accurate know-how in terms of garment construction and trend interpretation. 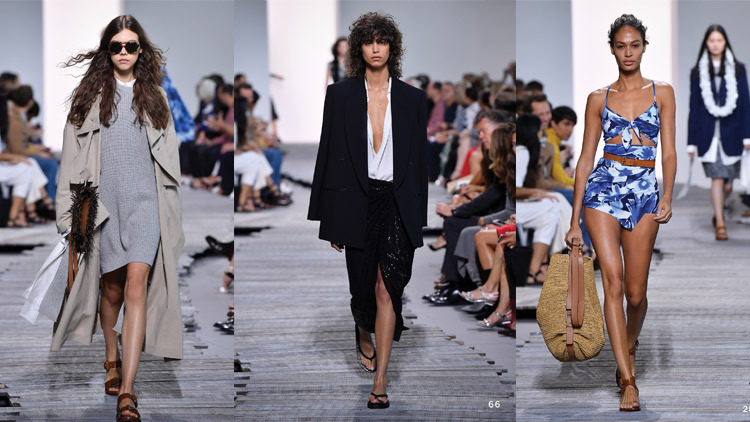 One of my top references is fashion designer Vera Wang, who also started designing wedding dresses and has developed an avant-garde maison with multiple lines, from ready-to-wear to perfumes to accessories. My aim is to create a solid fashion company, a brand that could fulfill the demands of fashion forward men and seductive and empowered brides-to-be. Is there a certain trend that you would like to make a comeback? I’ve always been inspired by art history, from contemporary creators to earlier ages like the Renaissance. But I must admit that my collections share a common retro-futuristic mood. It’s a real honor when fashion experts compare my creations to Pierre Cardin and André Courreges’ iconic designs. It’s so flattering! One of my obsessions is to mix technical fabrics with natural fibers. I have an unwavering commitment to comfort and flawless finishings. I would like my designs to contribute and redefine contemporary masculinity. Leading the way with bold colors and geometric prints. Do you have a certain celebrity that you'd like to be the spokesmodel for your brand? My designs have been worn by some of the top male and female models in the fashion industry, and I’m very grateful. Gorgeous Marina Pérez was our special guest for the last catwalk in Barcelona, and we’ve also had the chance to work with Jon Kortajarena or Andrés Velencoso before. Anyway, I believe that every single one of our customers could be the perfect spokesman/spokeswoman. Who is the Miquel Suay guy or girl? 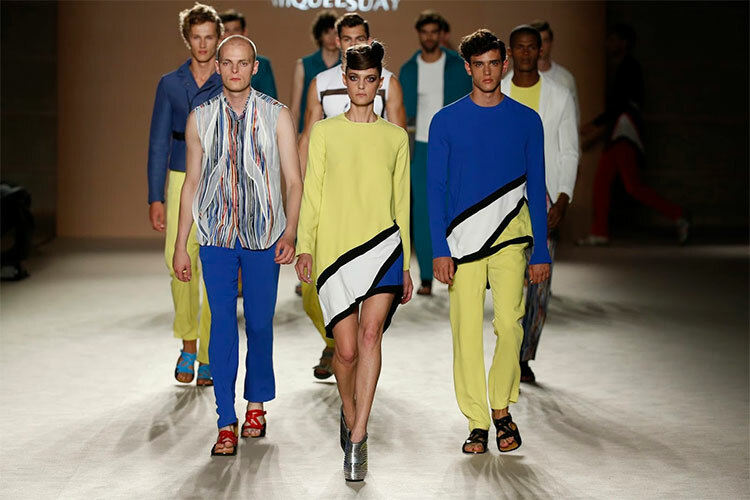 The Miquel Suay man is a fashion forward guy, who knows his intellect is his best weapon for seduction. He takes risks but loves comfort. He is a new man, one who adores silhouettes but also loves a classic tailored suit. The Miquel Suay woman is seductive and empowered. Since she feels comfortable in her own skin, she isn’t afraid to dress up and show the most sophisticated version of herself. 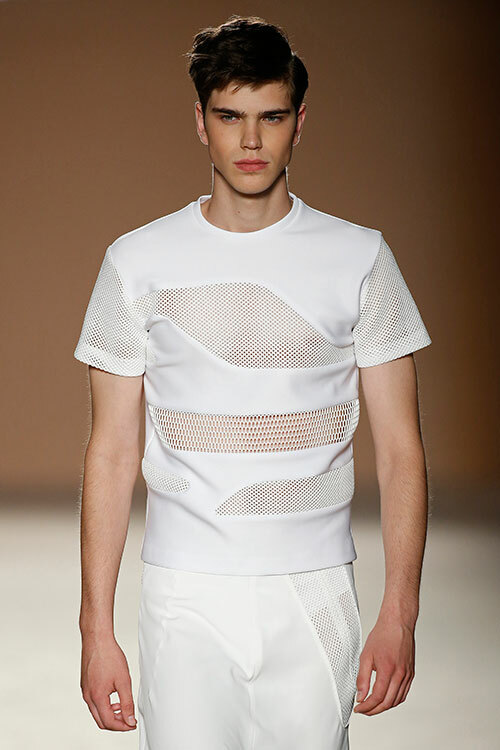 Model in mesh white t shirt. Do you ever dream of creating a collaborative collection with a certain brand or designer? For sure! But I think that instead of collaborating with a company from our own field, it’s more of a challenge to collaborate with different kinds of partners. A fashion brand is surrounded by such a rich and creative universe, that the possibilities of transferring it to other fields are endless. For instance, we have designed shoes for an espadrilles brand and collaborated with a winery as well. A few years ago, I made a collaboration with a furniture company and developed a set of colorful seats and cushions. I would love to deepen and strengthen these kinds of projects. Creative: because we are inspired by art and life itself. Innovative: because we have the experience but we also experiment with new techniques. Quality: because we choose our fabrics wisely and love to finish our designs like true artisans. 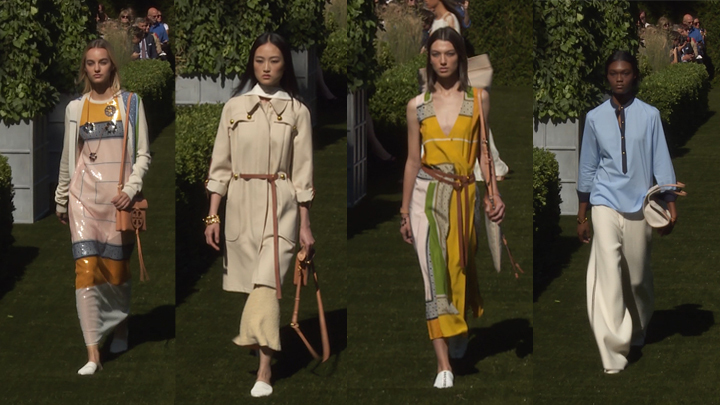 Inside Fashion Week, Barcelona airs Monday October 31st at 20:00 (UTC+2) Madrid, only on Fashion One.